Is The Right To Bear Arms Absolute? Absolutely Not. Are the individual rights named in the United States Constitution absolute? Not subject to any government regulation. With no wiggle room. No day light. No retreat. A right is always right, ironclad, inviolable and even sacred. Right? National Rifle Association (NRA) Executive Vice President Wayne LaPierre is certainly an absolutist when it comes to the second amendment and gun ownership rights. Since the Newtown shootings and the ensuing nationwide push to enact new and strengthened gun control laws, the NRA has opposed, absolutely, any and all efforts to curb or regulate gun ownership rights in any way, shape or form. The NRA’s answer to every single gun control proposal, curbing the size of gun clips, strengthening background checks for gun show sales, or banning certain types of assault rifle…the response is always an unequivocal “NO!” And not just “NO!” but “NO, not ever!” and “NO, absolutely!”. It must be great to be so absolute, so sure, so self-righteous and self assured in one’s views. But taken to the extreme, well…maybe the NRA should advocate for the complete and full dismantling of every last gun control law in the United States, wipe them off the books. If you are going to be absolute, then go all the way. So why not let minors buy and own guns? Or the mentally unstable: arm them to the teeth. Felons—why should we curb their right to have a firearm over a little thing like a prison sentence? No. Just erase every single restriction on the purchase and ownership of any and all arms. ABSOLUTELY. What is a tank but a very large gun mounted on a vehicle? Sell ‘em at Wal-Mart, right? Grenades? Just a very big bullet you can toss at a bad guy. Shoulder mounted missile launchers? Just a really big portable gun and who wouldn’t want to hunt with that kind of firepower? Bambi would think twice about showing her face in the woods. That’s the absurdity of being as absolute and dogmatic as the NRA is in its absolutist stand on the rights of gun owners. Rights are fundamental, absolutely. But rights are sometimes subject to government regulation when their exercise interferes with the rights and lives of others. I have the right to free speech, but, as Supreme Court Justice Oliver Wendell Holmes Jr. famously said, that does not allow me to stand up and yell “FIRE” in a crowded movie theater. I have the right to practice my religion but do not have the right to harm others in the practice of my faith. I have the right to assemble and protest but not in the middle of Storrow Drive at rush hour. I have the right as a newspaper columnist to the freedom of the press but not to intentionally libel a fellow citizen in print. Add this to the truth, THE TRUTH, that not one of the proposed gun control laws seeks to take away the fundamental right of American citizens to bear arms, and the lie of the NRA’s absolutist protests are revealed. Me thinks they doth protest way too much. It is time for America to come together, debate civilly, and then enact new and reasonable laws regulating the sale and possession of firearms. 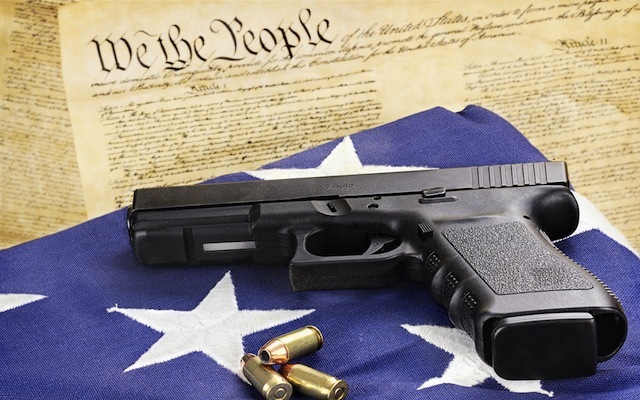 Is the Second Amendment right to bear arms absolutely right, all the time? Dare We Still Believe in Democracy? Is American democracy on life support? Or is there yet some hope for our sometimes battered but still standing 236 year old republic? In 2013 it is sorely tempting to look at Washington, D.C. and conclude that democracy just might be broken, that our elected leaders are no longer able to govern us effectively, and that the citizenry is too cranky and selfish for its own good. Gridlock abounds and is now seemingly the norm. America is more split along ideological lines than at any time since the Civil War. Partisanship pounds away at any efforts for compromise. Money rules in political circles. Politicians stagger from crisis to crisis, so often postponing the hard choices, unable to make any kind of resolute decision. If I was cynic I might draw all those conclusions and even begin to write a eulogy for democracy. But I can’t, not even with so much evidence to the contrary. For you see I’m a sucker for democracy and the spirit of idealism which undergirds it. Idealism: as Robert F. Kennedy so eloquently described this civic virtue: "Some men see things as they are and say, 'Why'? I dream of things that never were and say, 'Why not'?" Idealism is, quite simply, hope. For better days to come. Better ways to be discovered. Better spirits within each of us. A promised land. Not there yet but always courageously pushing ahead. Sometimes stumbling but tenaciously forging towards tomorrow. And so perhaps the real struggle in our nation these days is not about politics. Not about red states versus blue states. 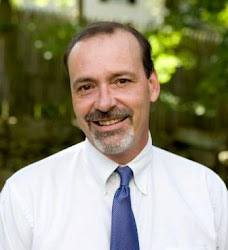 Republican against Democrats. Liberals lambasting conservatives. Tea Partiers taking to task Moveon.org. Maybe the real tug of war is for the soul of America and whether or not we as citizens still believe that democracy works. Still believe in the best motives on the part of our fellow citizens. Still believe that a people, given radical freedoms, can find a way to govern themselves and achieve the highest good for the greatest number of people. Still believe, in the words of President Obama, that our best days are yet to come. Do you still believe in America? I still do. Sometimes that belief is kind of corny. So yes I tear up when I watch veterans march in a Memorial Day parade, especially the older ones who proudly embrace the service they gave to their country. I get a lump in my throat when a choir of elementary school youth sings “America” at a Martin Luther King Day celebration and know these kids actually believe that the dream is still alive. I get the chills when I walk into a voting booth and have the privilege to cast my ballot in privacy and safety, knowing that millions of others would die for that gift. I get a little twinge of satisfaction when I send off my quarterly state and federal tax payments, knowing that in writing those checks I’m doing and paying my fair share. Do you still believe in America? I know I did again this week when I witnessed the inauguration of Barack Obama to a second term as the President of the United States, and on Dr. King’s birthday too! What would Obama’s forbears, who just 152 years ago were shackled in the chains of human slavery, think of such a civic miracle? Could such a revolution have taken place in any form of governance other than democracy? And no doubt, sooner than later, it will be a woman who takes that oath. Freedom is sometimes slow in coming but it cannot be stopped. No room for cynicism here. So yes, I’m guilty. I do still believe in America and the promise of American democracy. It is messy. It is a perpetual work in progress. It is a grand experiment. It demands idealism as its lifeblood. Cynicism may be chic, may sell newspapers, may even feel good somehow in a warped way, but cynicism is a cancer in the body politic. Do you still believe in America? I’m willing to take that idealistic leap. Will you? Say it ain’t so Lance. 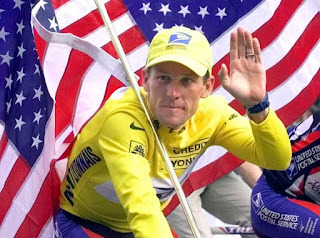 If the rumors are true, this week cyclist, cancer survivor and American hero Lance Armstrong will publically admit for the first time that he used performance enhancing drugs in competition. He’ll confess that he cheated. He skewed the playing field to his advantage. He played his game with a stacked deck of cards. He lied about the true state of his body. He lied when he denied charges of doping even after eleven of his teammates outed him as a drug user. He lied about a public persona which helped create Live Strong, one of the most successful cancer charities ever. So now the myth of this once truly inspiring man and role model will crack and crumble and maybe even fade away and that’s just really sad. All Armstrong had to do was play the game on a level playing field. Play straight and true and honestly. Play with no hidden or false advantage on the course. Follow the moral and ethical admonitions all of us receive from parents, coaches, teachers and clergy as we grow up and play the game of life. Don’t cheat. Tell the truth. Play fair. Live authentically. Try your best against an opponent. Use all your God given gifts, but then let the game and nothing else determine who wins and who loses. For then, whether defeated or victorious, you know that you competed with integrity and honor. You know that you did your best and played with sportsmanship and character. Armstrong’s fall from grace is a tragedy because his mythical biography was and is so amazing. Here is a man who beat testicular cancer, even after that disease spread to his brain and lungs. A super athlete who seven times in a row won the most difficult sporting event in the world, the Tour de France, a 23 day, 2,200 mile bike race. He was an American prince who fell in love with and was engaged to an American pop princess, the singer Sheryl Crow. 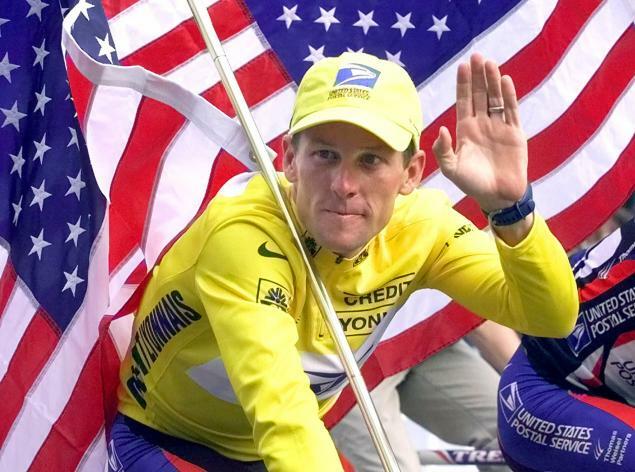 Armstrong was an American hero, founding a foundation to fight cancer, with its ubiquitous yellow wristbands and powerhouse fundraising. We cheat because winning becomes more important to us than doing the right thing. We cheat in the conceit that the rules don’t apply to us. We cheat because our fear of losing overpowers our fear of getting caught. We cheat because we live in a culture which lionizes and worships the winners and often dismisses or even crucifies “the losers”. We cheat thinking it will only be this once but then get so caught up in our lies that we cannot stop. We cheat because no one is looking and it seems so easy. But of course there is another way. We can live this life and play this life on a level playing field. This is how most humans do live day to day: with honesty. So even as Armstrong tumbles and we are ready to once again become jaded and cynical about the human condition, let’s celebrate the famous and anonymous folks who do play by the rules. And then before we pick up that rock of judgment to hurl at Armstrong, let’s also remember the times, not so public or dramatic, when we have been tempted to cheat in the game of human life. To be human is to have a bit of the angelic and the demonic within. God’s gift of free will puts us all on the field, but finally it is up to each of us to choose whether or not to compete in truth or falsehood. Say it is so, Lance. Live strong, live true. Welcome back to the level playing field. 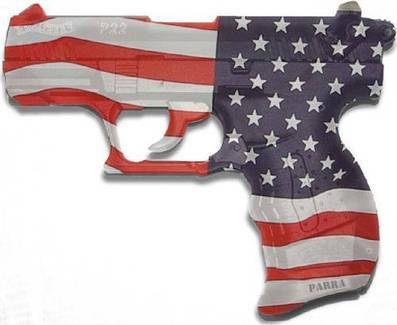 After Newtown: Is The Right to Bear Arms Right? Does a legal right ever make a wrong? It’s now been almost a month since a gunman walked into the Sandy Hook Elementary School in Newtown, Connecticut, opened fire and killed twenty school children and six adults. It was the second most deadly mass shooting in the history of the United States, surpassed only by the killing of 32 people by a gunman at Virginia Tech University in 2007. A lot has happened since December 14. Victims have been laid to rest. Thousands of folks visited Newtown to offer sympathy and support. Prayers have been prayed in houses of worship worldwide. Funds raised for the victims’ families. Vice President Joe Biden leads a gun control task force. Massachusetts Governor Deval Patrick is pushing for new gun control laws here. The National Rifle Association (NRA) came out with rhetorical guns blazing a week after the shooting, declaring that the real problem was not enough guns in the hands of law abiding citizens. They want an armed guard in every school in America. But nothing has happened really. America is still the most armed nation in the entire world by far, with 270,000,000 guns in civilian hands in our country. That’s about nine guns for every ten Americans. The next closest rate of gun ownership is in Yemen, at about half of our number. The United States still has the highest rate of gun related murders among all developed countries in the world: four times as many firearms deaths as the next two nations, Turkey and Switzerland. Americans are twenty times more likely to be killed by a gun than in any other of its peer nations: Japan, Britain, France, Germany, etc. So I guess we Americans still do love our guns, Newtown be damned. Guns to protect ourselves, our loved ones and our property, right? Guns to protect ourselves from the government, as I’ve heard some more radical gun rights proponents argue. If the people are well armed, they will not be ruled by tyrants. And it is not like the Second Amendment right to bear arms is threatened. Just five years ago, the United States Supreme Court ruled that the individual right to bear arms for lawful purposes is constitutionally guaranteed and unconnected to service in a militia. But here’s one question that’s yet to be asked: is a right always right? What if America’s unquestioned individual right to bear arms infringes on my individual right as a non-gun owning citizen to my life, my liberty and the pursuit of my happiness? As someone who does not own a gun, who has absolutely no interest in ever possessing or firing a gun (which is, after all, designed to kill): have I any rights in this debate? Any at all? Like the right to know that I am safe in public, even as so many of my fellow citizens are packing heat. The federal government’s General Accounting Office estimates 8,000,000 Americans have permits to carry a concealed weapon. If that reality makes me feel much less safe, that so many of my neighbors potentially have a hidden weapon on their person, do I have any recourse? How do I know that they even know how to properly use that gun or have the mental stability to own a weapon? How do I know that their gun won’t be inadvertently used to hurt or kill me the next time I’m in line at Starbucks and a cowboy or cowgirl feels threatened by whatever and decides to open up? If I had a child, could they be forced to attend a school where armed guards and even teachers possess a weapon? What of my right to have a son or daughter educated in a truly safe place? Can the NRA or anyone else guarantee that when the guns come out the next time in a school house, my son or daughter won’t be wounded or killed by an errant bullet fired by a well meaning but inept “protector”? Can the local school committee now insist our children go to a school marked by the four r’s—reading, writing, ‘rithmetic and rifles? I get the notion of individual rights. 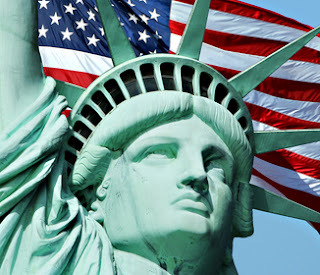 I’m grateful for all the individual legal rights I live under and enjoy as an American. But what I do not get is the continued dogmatic, rabid, stubborn, unyielding, and ultimately selfish and deadly insistence by the NRA and folks of that ilk that their right to bear arms is untouchable. Sacred even. Like it is a constitutional god to be so worshipped that any effort to regulate or limit that right is a civic sin. That this right trumps any and all other rights, any notion of community responsibility or moderation or logic or reason. You may have a right to your gun. But I have a right as well, to live in a safe nation, a community not just safe from the “bad guys”, but also safe from the supposed “good guys” who still so love their guns and their “rights”. Let’s have that debate. Is your right, right?